Jon Renau Sapphire! 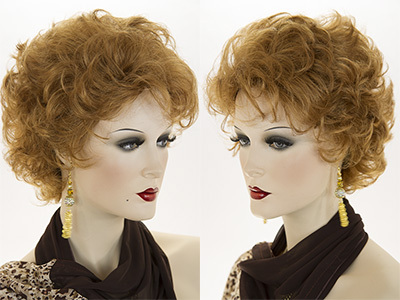 High voltage curls and lofty volume create carefree style with this chin length wig. 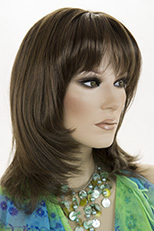 Soft bangs help create a flattering, face-framing shape. Available in large cap size. Youthful and chic! Premium quality, short, medium length, straight, wavy human hair shag cut. The hair is approximately 3 1/2 inches long through out. Featuring a classic cap. 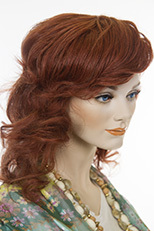 Wear it straight out of the box, or add waves with a curling iron! See item details for available colors. Sophisticated, chic, arty, retro, asymmetrical salon cut. 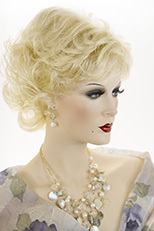 Short, glamorous pixie style, which appears like an up do and has short hair on the right side and longer side swept curly waves on the left. Heat friendly fiber for styling versatility. See item details for available colors. Long and dramatic! Straight silky hair 21 to 30 inches in length. Bangs are 8 inches long. Featuring a natural looking skin center part. Dramatic color starts from underneath to tips of hair. See item details for available colors. Inspired by Harley Quinn! White blonde, pink and blue! 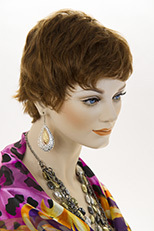 Fun Costume wig with two high pigtails, a center part and two long strands of wavy hair framing the face. 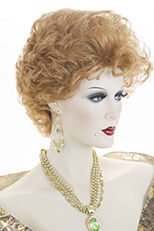 The pigtails are 16 inches in length and the long thin face framing strands are 20 inches in length. See item details for available colors.